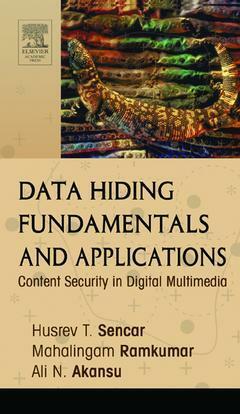 Data Hiding Fundamentals and Applications Sencar Husrev T., Ramkumar Mahalingam, Akansu Ali N.
Authors: Sencar Husrev T., Ramkumar Mahalingam, Akansu Ali N.
Add to cart the livre of Sencar Husrev T., Ramkumar Mahalingam, Akansu Ali N.
* Data hiding algorithms for image and video watermarking. Introduction. Frameworks for Data Hiding. Communication with Side Information and Data Hiding. Type-I (Linear) Data Hiding. Type-II and Type-III (Non-Linear) Data Hiding Methods. Advanced Implementations. Major Design Issues. Data Hiding Applications.